SEPERATE EGG WHITES FROM YOLKS AND WHISK WHITES UNTIL SOFT PEAKS FORM. IN ANOTHER BOWL PUT THE YOLKS, HALF OF THE TUB OF QUARK,2 TBLSP CANDEREL,FEW DROPS VANILLA ESSENCE,BAKING POWDER. WHEN PEAKS FORM FOLD IN THE ABOVE INGREDIENTS THEN ONTO A GREASED TRAY LINE WITH GREASEPROOF PAPER AND ADD THE CAKE MIXTURE, PUT IN OVEN FOR 10/15 MINS UNTIL GOLDEN BROWN I DID GAS MARK 5/6. WITH THE OTHER HALF OF THE QUARK THE REMAINING CANDEREL AND STRAWBERRIES OR RASP, ADD SUM MORE ESSENCE TO TASTE MIX IT ALL UP. WHEN THE CAKE IS BROWNED LEAVE TO COOL TURN OUT ONTO A SURFCE TAKING THE PAPER OFF, ADD THE QUARK MIXTURE AND ROLL UP INTO A SWISS ROLL ADD ICING SUGAR IF WANTED! SEPARATE THE EGGS. WHISK EGG WHITES TILL THEY FORM PEAKS, SET ASIDE. MIX EGG YOLKS WITH ½ A TUB OF QUARK, THE BAKING POWDER, CANDERELL, GRATED RIND OF THE LEMON AND A SQUEEZE OF IT’S JUICE. FOLD THIS MIXTURE INTO THE EGG WHITES. POUR INTO A LINED AND SPRAYED WITH FRYLIGHT SWISS ROLL TIN AND COOK FOR APPROX. 10 MINS TILL GOLDEN. TURN OUT AND REMOVE PAPER. WHEN COLD, SPREAD THE JELLY MIXTURE ONTO THE SPONGE, AND ROLL UP. MIX THE REMAINING QUARK WITH LEMON JUICE, AND CANDERELL TO TASTE. 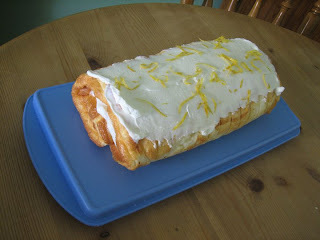 SPREAD ON TOP OF ROULADE AND DECORATE WITH SOME LEMON PEEL SHAVINGS.